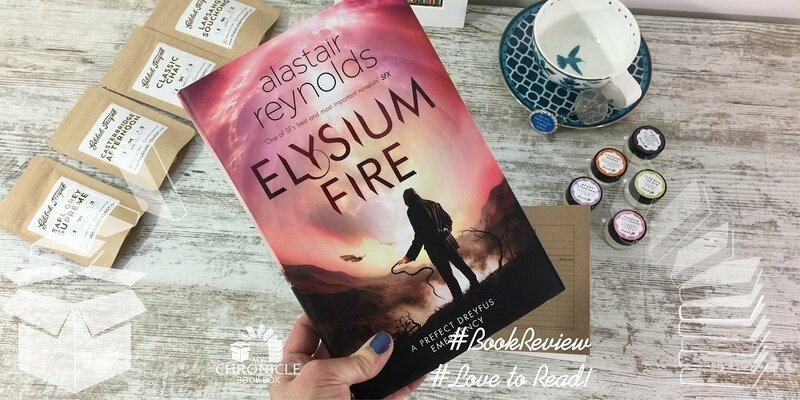 A My Chronicle Book Box review of Elysium Fire by Alastair Reynolds. Prefect Dreyfus returns for a second emergency that has the potential to be catastrophic - the advanced technology that is implanted in all of the citizens of the colonies is being used as a murder weapon. In this fast paced sci fi, crime story it is down to The Prefects to find out how and why the murders are being committed and stop them. This book was included in our February 2018 Science Fiction & Fantasy book box. Fans of Alastair Reynolds will no doubt be thrilled and possibly surprised that we have been treated to a second Prefect Dreyfuss novel over a decade since the original. The first novel was called The Prefect and has now been renamed Aurora Rising. If you haven’t read Aurora Rising don’t worry you don’t need to to fully enjoy this book. If you haven’t read any Alastair Reynolds before then be prepared to be blown away by this fast paced science fiction crime story.You may be interested to know that this set in the same version of the universe as the Revelation Space series. The Prefects are policemen of the very unique democracy of the colonies known as the Glittering Band which are in orbit of the Planet Yellowstone. When the implants that all citizens have in their brains begin causing deaths it falls to Prefects Dreyfus, Ng and Bancal to investigate. That no one knows why or how this is happening is very alarming add to that the fact that the deaths are increasing exponentially and this is true emergency. The pressure is on to find out who is behind it and stop it before the population is decimated. There are a number of storylines in the novel which intersect, the main two being that of the Prefects and that of two twin boys growing up in an isolated geodome. The storylines seem very separate until they finally connect. Alastair Reynolds is a master of his craft and this is another excellent example of space opera. I love the pacing of this book, the engaging characters - the dark and moody Dreyfus contrasted with the other Prefects, and the engrossing setting. There are aspects to this story that remain unresolved suggesting that a third (or even more!) books might be expected in this series. I certainly hope so! A brilliant new mystery from the author of THE PREFECT. Featuring Inspector Dreyfus – one of Alastair Reynolds most popular characters – this is a fast paced SF crime story, combining a futuristic setting with a gripping tale of technology, revolution and revenge. Featuring Inspector Dreyfus – one of Alastair Reynolds most popular characters – this is a fast paced SF crime story, combining a futuristic setting with a gripping tale of technology, revolution and revenge. One citizen died a fortnight ago. Two a week ago. Four died yesterday . . . and unless the cause can be found – and stopped – within the next four months, everyone will be dead. For the Prefects, the hunt for a silent, hidden killer is on . . .
Alastair Reynolds has returned to the world of The Prefect for this stand-alone SF mystery in which no one is safe. The technological implants which connect every citizen to each other have become murder weapons, and no one knows who or what the killer is – or who the next targets will be. But their reach is spreading, and time is not on the Prefects’ side. Alastair Reynolds was born in Barry, South Wales, in 1966. He studied at Newcastle and St Andrews Universities and has a Ph.D. in astronomy. He stopped working as an astrophysicist for the European Space Agency to become a full-time writer. REVELATION SPACE, PUSHING ICE and HOUSE OF SUNS were shortlisted for the ARTHUR C. CLARKE AWARD; REVELATION SPACE, ABSOLUTION GAP, DIAMOND DOGS and CENTURY RAIN were shortlisted for the BRITISH SCIENCE FICTION AWARD and CHASM CITY won the BRITISH SCIENCE FICTION AWARD.